‘Aussie’ flu. Should we be worried? The NHS is preparing itself for a bad flu season. One of the strains circulating this year – H3N2 – has been dubbed Aussie flu because it is the same strain that recently caused big problems for Australia. Australia’s 2017 flu season was the worst the country had experienced in nearly a decade. Experts are waiting to see if similar will happen here in the UK, after a recent rise in cases. Every winter there are a few strains circulating and Aussie flu or H3N2 is just one of them. It is an influenza A virus that appears to cause more severe infections in young children and the elderly. Most people will recover in about a week and won’t need any specific treatment, apart from a bit of bed rest, some paracetamol or ibuprofen and drinking plenty of fluids. But for some – the very old, very young or people with pre-existing health conditions such as heart disease – flu can be deadly. Is Aussie flu worse than other types of flu? The UK is seeing a mix of flu types circulating including influenza B as well as the H3N2 strain. H3N2 is not new. It was around last winter too. Any strain of flu, including H3N2, can be dangerous for people who are vulnerable to it. Experience from last winter suggests the elderly are a high risk group for H3N2. Influenza viruses are given different names based on their type – A, B and C. A is usually the most serious while C is usually a milder infection. They can be further subdivided according to the proteins that they carry on their surface. These are called H and N antigens. Hospital admissions and GP visits for influenza have seen a sharp rise going into 2018, but are still comparable to the previous winter and are nowhere near as high as in 2008-09 when the swine flu pandemic hit the UK. Nick Phin, Interim Deputy Director for National Infection Service at Public Health England, said: “Flu activity, as measured by a number of different systems, has continued to increase in the last week or two. This is to be expected as the season progresses, and while no two flu seasons are the same, the numbers are in-keeping with previous years. What about the flu jab? 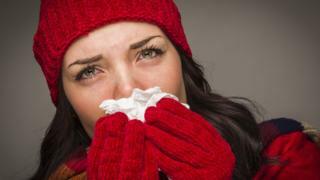 The vaccine is designed to protect against the type of flu circulating in any given season. Every year, the World Health Organization reviews the global situation and recommends which flu strains should go into the vaccine to be manufactured for the following season. This year’s flu jab is designed to protect against H3N2 as well as some other strains. Vaccination is the best protection we have against flu. But flu is unpredictable. Flu viruses constantly mutate and change, so it is a moving target to fight. Public Health England says typical effectiveness of the flu vaccine is 40-60%, which means that for every 100 people vaccinated, between 40 and 60 will be protected. At risk people are advised to have annual flu jabs because flu strains can change from year to year, plus protection from the flu vaccine may wane after about six months. Adults aged over 65, pregnant women and those with underlying health conditions are advised to get a free flu jab. A flu nasal spray is available free to young children, who are thought to be the main spreaders of flu. Why doesn’t it stop all strains? In general, current flu vaccines tend to work better against influenza B and influenza A/H1N1 viruses than H3N2, according to US experts at the Centres for Disease Control and Prevention. And it’s already known that flu vaccines may work less well in elderly people because they have weaker immune systems. Dr Richard Pebody, from Public Health England, said: “This season’s flu vaccine should be providing reasonable protection, similar to last winter. Last year the vaccine did not give quite as good protection for the elderly for H3N2. How the vaccines are made might also determine their effectiveness, according to research. Flu vaccines used in the UK and in many other parts of the world are currently grown in chicken eggs and this process can be tricky. Recent research in the journal Proceedings of the National Academy of Sciences (PNAS) found the H3N2 part of the flu vaccine did not grow simply during this process and developed mutations. When they tested the vaccine in animals and humans they found the H3N2 part did a partial job of protecting against this strain of flu. The vaccine had 20-30% effectiveness against H3N2. Experts stress this is still our best defence against the virus. And the jab provides excellent protection against other flu strains. Experts recommend that all those who are eligible for a free flu jab on the NHS should take up the offer. If you want to protect yourself against flu and you’re not in one of the groups, you can buy the flu jab from high street pharmacies. Children aged six months to two years at risk of flu are also entitled to a free flu jab. If you develop sudden chest pain, have difficulty breathing or start coughing up blood, call 999 or go to A&E. Flu is very infectious and easily spread to other people. You’re more likely to give it to others in the first five days.